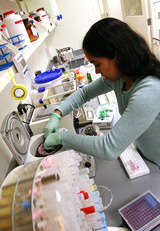 The Program in Quantitative and Computational Biology is offered by the Lewis-Sigler Institute for Integrative Genomics and its affiliated departments. It is designed for students with a strong interest in multidisciplinary and systems-level approaches to understanding molecular, cellular, and organismal behavior. The curriculum introduces students to experimental and analytic techniques for acquisition of large-scale quantitative observations, and the interpretation of such data in the context of appropriate models. Strong emphasis is placed on using global genome-wide measurements (e.g., microarray gene expression, sequence, phenotype) to understand physiological and evolutionary processes. Examples of ongoing research include organizational principles of metabolic networks, quantitative modeling of cell-biological processes, mapping the genetic basis of complex bacterial behavior, comparative genomics analysis of regulatory networks, the genetic basis of quantitative phenotypic variation, and genomic plasticity and mechanisms of phenotypic adaptation. At the core of the curriculum is independent research initiated in the fall of junior year, in which students participate in the design, execution, and analysis of experiments in a host laboratory of their choice. The required courses provide a strong background in modern methodologies in data analysis, interpretation, and modeling. A certificate in quantitative and computational biology is awarded to students who successfully complete the program requirements. Note that the Graduate Program in Quantitative and Computational Biology is distinct from this Undergraduate Program.